35.5 Foot Liverpool Class Lifeboat. 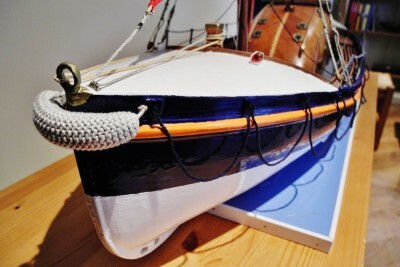 This model depicts a typical example of an early boat of the class built in the first half of the 1930’s. It had a single 40HP petrol engine but also had sails, and a lifting keel for use when sailing. The boat weighed about 6 tons, and had a top speed under power of 7 knots, and 10 knots under sail. They were not self - righting. They were designed to be launched from a beach, but some were slipway launched. This precision model, showing a highly skilled degree of craftsmanship, was built by Ian Black, 1 Arran Avenue, Peterhead. 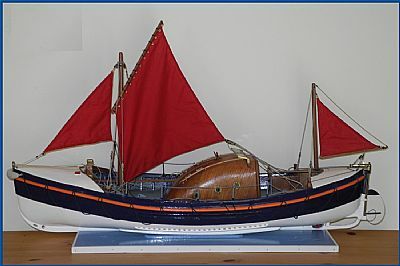 In September 2015, Ian generously donated this model to the Maggie Law Maritime Museum, which will serve to preserve the memory of the “Margaret Dawson” and all other Gourdon lifeboats and their crews. 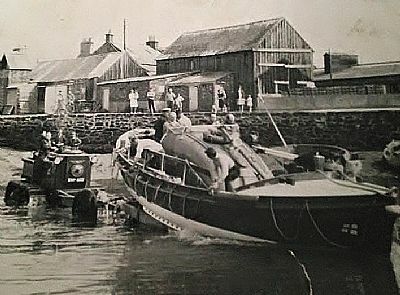 James Freeman Ritchie of Gourdon, was a crewman on the “Margaret Dawson.” James was taken prisoner by the Germans as one of a crew of six, when their boat the “Bella” was sunk in Catterline Bay by a German U – boat in 1916.